Palácio da Pena — Nom Voyage! The Palácio Nacional da Pena is one of those special places that springs to mind whenever people think of Portugal. Friends and relatives ask us, "Have you been to that castle?" and we know exactly what they're talking about. One of my good friends told me her Portuguese friend has it tattooed on his leg. So naturally when family came to visit recently, we took the obligatory (but much-looked-forward-to!) trip to Sintra. You get to Sintra from Rossio Station (inside shown above) near Rossio Square. Don't make the same mistake we did the first time in assuming Rossio Station is inside the Rossio metro station. It's not, but it is nearby. I think this last time a round trip ticket from Rossio to Sintra was about €5. The trip takes about 40 minutes and once you arrive, there are several buses outside the station and to the right that can take you to Sintra's various castles. The bus lets you out at the entrance to Pena, which is at the bottom of a steep hill that must be climbed to access the Palace. Tickets can be purchased there for €11.50 for adults, €10 for seniors, and €9 for kids aged 6 - 17. Prices for children age 5 and under aren't mentioned, so admission may be free. We arrived later in the day, so we were only able to see Pena, but there are several days' worth of castles and palaces to visit in Sintra, plus a lot of shops, restaurants and cafes. I would recommend budgeting about 2 - 4 hours for each palace/castle, and visiting maybe 2 per day (3 if you are really ambitious and can get up super early). When it started to rain and the wind began whipping up, we escaped to the inner reaches of the palace. Make sure to hold onto your ticket stub so you can get inside. You can photograph inside the palace, but flashes are not allowed. 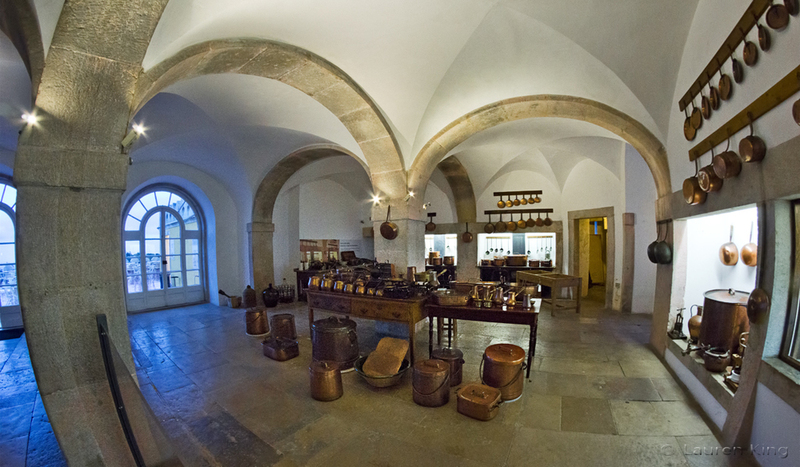 I was particularly enamored with the palace's kitchen. I wish I could have watched people working in there back in the day. When we'd seen it all, we trekked back down the hill to take the bus into town that would take us to the train station and back to Lisbon. The bus stops running around 7:00 or 8:00 PM, so if you stop for dinner in Sintra and finish up later you can either walk (about 15-20 minutes) or take a cab.